Platinum Tool Technologies is a leading designer and mold manufacturing company serving Ontario, Michigan, USA, and Mexico. 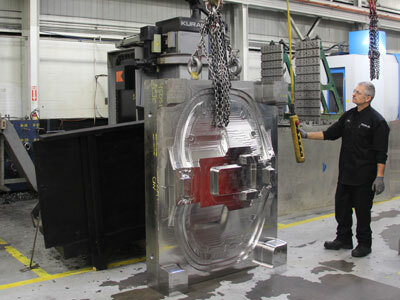 We are a manufacturer of production and prototype molds for the automotive, appliance, and industrial markets. Utilizing the principles of Lean Manufacturing, we have maximized productivity and quality while reducing both the lead time and costs to our customers. A highly skilled workforce, innovative technology, and stringent quality standards ensure we consistently meet and exceed our customer’s expectations. Together, with our advanced machining capabilities (EDM, VISI, and multi axis CNC machining, we are able to produce the highest quality molds regardless of the complexity of your tooling needs. Our Canadian facility has more than 30,000 square feet for the design and manufacturing process. Maximum Productivity – machining tools using the latest high speed machining practices. The accuracy of our tools and surface finishes reduce polishing time. Highest Quality Possible – we go beyond customers expectations and our ISO certification requirements. All tools are CMM verified by an independent third party to assure quality and dimensional integrity, and are tested prior to shipment. Skilled Team – Our skilled well trained team is empowered with the latest technology and software available , utilizing lean manufacturing techniques. Platinum Tool Technologies offers a complete line up of superior mold manufacturing services for the production of a wide variety of plastic parts and components. Using the latest in technological equipment, innovative design, and cost efficient manufacturing techniques, our team can provide you with a variety of tooling options for your customers part and application needs. The industries we serve include transportation, household appliances, and other industrial markets. Our molds and the parts produced for the transportation sector by our Platinum Team have been used by a variety of satisfied OEM’s including General Motors, Honda, Daimler Chrysler, Ford, Aston Martin, Toyota, Nissan, Mitsubishi, BMW, Mercedes Benz, Bombardier, Harley Davidson, Volvo, Volkswagen, Land Rover and Jaguar. Contact us to discuss how our mold manufacturing services can work for you.